What Is A Percussion Instrument? A percussion instrument is any instrument whose sound is made by being struck, shaken, rubbed or scraped. These actions create sound because they cause these objects to vibrate, then transfer those vibrations into the air where the ear translates them into sound. Drums are some of the most commonly played percussion instruments. A drum is made of a head--tightly stretched, flexible material of synthetic fibers or natural animal skin--placed over a hollow, cylindrical frame. A drum is played by striking the head, creating vibrations that are amplified as they echo throughout the hollow chamber below. Some kinds of drums are made to play particularly pitches. Kettle drums, or timpani, have pitch which is adjusted by changing the tension of the heads. Some drums have pitch but it is permanently set in place. The smaller and tighter a drumhead is, the higher the pitch it produces, since it will vibrate at a faster speed. Other drums produce no discernable single pitch within the Western scale and are played instead for the quality of their timbre. Some of these drums may make short, dry sound (such as a snare drum) or deep, booming sounds (like a bass drum). In the context of percussion instruments, those instruments that are considered members of the "keyboard" family are those played with hand-held mallets on keys that resemble a piano keyboard, such as a xylophone or marimba. The keys of these instruments are specially shaped bars of metal, wood or synthetic fiber that produce a pitched sound when struck. As with the drum heads, smaller bars produce higher-pitched sounds and larger bars produce lower sounds. The bars are arranged left to right from lowest pitch to highest pitch. Some keyboard instrument keys produce sound without any need for amplification since they are made of highly resonant materials, such as the dense-metal keys of the keyboard bells. Others, such as xylophones, marimbas and vibraphones are amplified with a series of long pipes arranged below the instrument, one beneath each key. These create resonance and amplification in much the same way that a drum's frame does. Besides these two main schools, other supplemental percussion instruments--known as "auxiliary percussion"--are numerous and work in different ways. 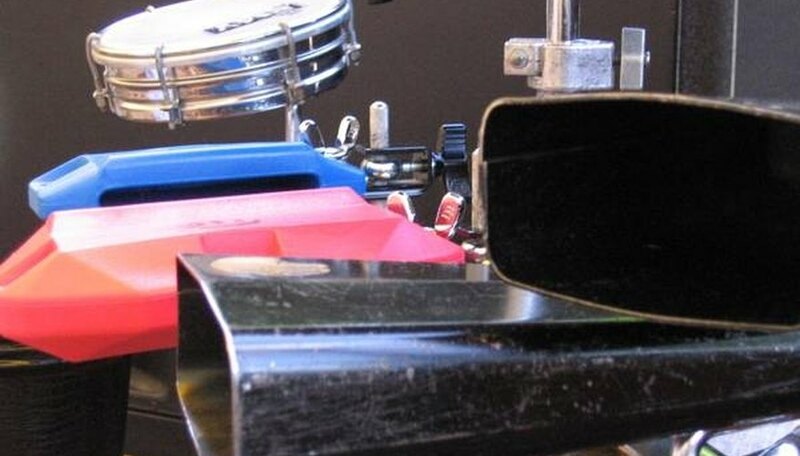 Auxiliary percussion instruments can include whistles, shakers (hand-held, hollow, sealed containers of seeds or beads that rattle), noisy ratchets, bells, cymbals, water-filled wineglasses or any object that can make an interesting sound when struck and set to vibrate. What Are the Different Types of Instrumental Groups?